She received a diploma of a medical doctor at the Faculty of Medicine of Collegium Medicum of the Jagiellonian University in Krakow. She has completed a number of courses and trainings in the field of aesthetic and anti-aging medicine in the country and abroad, which allows her to practice the techniques of beautifying the face and body (facial reconstruction using polylactic acid (Sculptra) and calcium hydroxyapatite (Radiesse), botulinum toxin injection in the treatment of mimic wrinkles and hyperhidrosis, fillers of hyaluronic acid (hyaluronic threads, soft lifting, elimination of wrinkles and furrows, filling in lips and cheeks), mesotherapy, lipolysis, sclerotherapy, medical peels, Silhoette Soft and PDO lifting threads, fat grafts, treatments .In order to perfect skills among the best she went through numerous foreign trainings, among others, in 2007 training with Dr Elisabeth Dancey at the Clinic in London and training with Dr. Sandrine Sebban in Paris in 2013. Moreover, she constantly raises her professional qualifications through participation in courses, congresses, trainings and conferences both in the country and abroad. 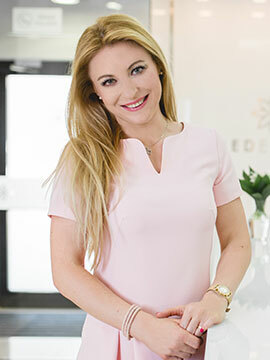 With my patients I have a special bond that goes beyond the standard doctor-patient relationship, because aesthetic medicine is not only the treatment of imperfections, but also the medicine of the soul and self-confidence in everyday life. She worked in the II Department of Internal Diseases of the University Hospital in Krakow for seven years , where both as a clinician and as an assistant she taught medicine to Polish and foreign language students. In 2011, she passed a specialist examination and received the title of specialist in internal medicine. Having a specialization in internal medicine allows her to have an extremely holistic approach to each patient, taking into account particularly strongly the impact of the performed treatments on the general health of the patient. In 2013, she defended her doctorate-PhD thesis entitled “Clinical phenotypes of asthma with hypersensitivity to aspirin” at the Faculty of Medicine of the Jagiellonian University in Krakow and received the title of doctor of medical sciences. From 2011 to 2014, she worked at the Outpatient Clinic of the Clinical Hospital in Warsaw, where she specialized in allergology. After passing the National Specialist Exam in 2015, she obtained the title of an allergist. He is the author of publications and scientific reports and a member of scientific societies, among others Polish Society of Aesthetic Medicine and Anti-Aging of the Polish Medical Society, World Society Interdisciplinary AntiAging Medicine (WOSIAM), European Society for Cosmetic and Aesthetic Dermatology (ESCAD) and Polish Society of Allergology. She acts as an expert in the “Let’s talk about Health” programme, “Pytanie na śniadanie”(“Question for Breakfast”) on TVP 2 and writes articles about aesthetic medicine to bring the topic closer to patients. She trains doctors in the field of botulinum toxin, hyaluronic acid and laser techniques. She is a happy wife and mother of two children. Her passion (outside of work) is sport – she loves to run, swim, practice fitness, go skiing and spend every spare moment actively. She is a lover of a healthy lifestyle – she acts in this way and persuades her patients to do it. A healthy diet and physical activity are the key to happiness!